Zucchini or as we Indians like to call it “Turai” or is a frequently used vegetable at my home. Though my family does not like zucchini I try to sneak it into dal almost everyday and into healthy noodles. Still, some more zucchini was waiting for me in the fridge, so I thought of preparing some moist and yummy zucchini muffins. Cakes and muffins are always a big hit at my place. You can prepare these muffins in batches and freeze , they stay good for 3 months. They will make delightful evening snacks when you are short on time and have ravenous kiddos to feed. Zucchini is a wonderful option if you are looking to lose some weight also in a healthy way. It is great for eyesight,asthma and is a rich source of Vitamin C. Apart from that it has a high content of protein, fiber, folate, and Vitamin A. 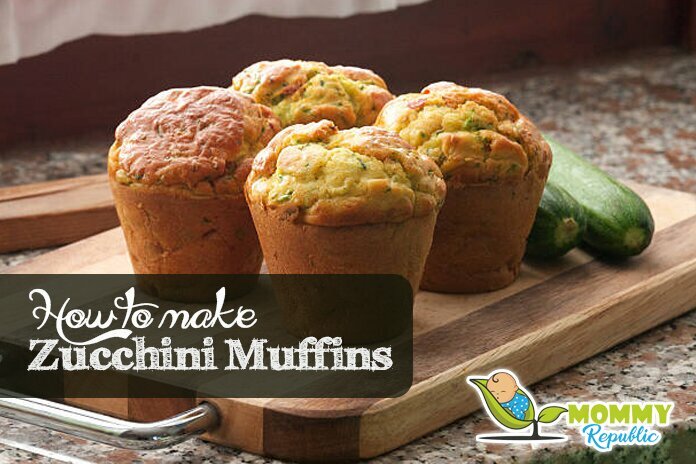 Here goes the recipe of moist and delicious zucchini muffins . I have made use of walnuts as topping instead of choco chips. It gives a crunchier and tasty flavor. Walnuts are a rich source of dietary fiber, protein, Vitamin B6, Vitamin B 12. I have used the sweetness of honey instead of sugar, you can also make use of jaggery. Preheat the oven to 180 °C. Line muffin paper liners on the muffin try. I prefer to grease the muffin tray with butter. Take a wok and dry roast the walnuts for 2-3 minutes in medium flame. This gives a crunchy taste. Roughly chop the walnuts. Take a large mixing bowl and beat honey and butter until they are combined. Now add the egg to the mixture one by one and beat well. To the same mix add buttermilk and vanilla extract. Beat well. Take a mixing bowl and add all the dry ingredients i.e whole wheat flour, cinnamon powder, baking powder , baking soda, salt and mix all the ingredients with a spatula. Now add the grated zucchini and walnut to the dry mix. combine the wet and dry ingredients with a spatula. Divide the entire batter evenly between 6 muffin cups. Bake the muffins in the baking mode for 15-20 minutes or until a toothpick inserted comes out clean. Cool on rack.